This recipe was written on a lined index card and found in a large collection, date unknown. I’ve typed it below along with a scanned copy (front side only). Combine b. sugar, oats, flour, salt. Cut in shortening until coarse crumbs. Spread half mixture in shallow pan. Cover with filling. Spread remaining mixture over filling. 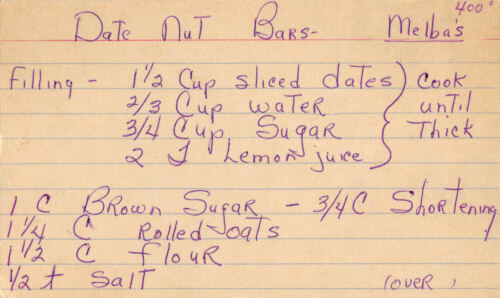 Since last Christmas, I have misplaced my mother in laws recipe for her date nut bars. She made them every Christmas for 45 years. I took over the job about 8 years ago! I have searched the web for a similar variety. I think this is it~! I made these today and we love them. I’m making the Lemon Bars tomorrow. Thanks so much for this post! My Mother used to make all kinds of Date Recipes for Christmas, this will make us think of her when we enjoy them this coming Holiday! The recipe card only showed the front side, and that was the only info typed, so the amount of nuts was not included in the recipe! Could you give the backside ingredients from this card that would complete the recipe please?